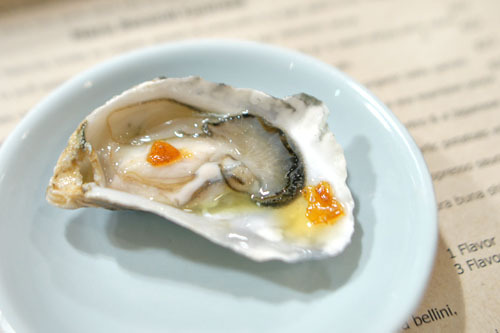 Coming hot on the heels of his appearance at Plate by Plate, Matthew Biancaniello's latest project is entitled "Boozy Oysters," and, as the name implies, features alcoholic takes on everybody's favorite mollusk. 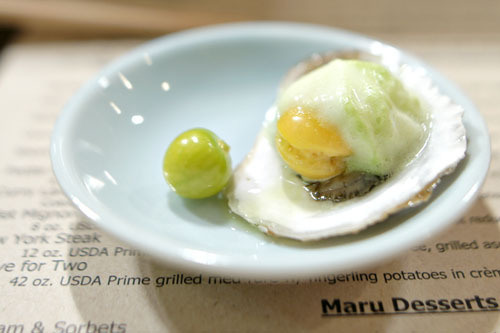 The one-night-only affair was held at the new Santa Monica-adjacent Maru in collaboration with Maru's chef, Jason Park. Park, of course, is also the man behind Ramekin dessert shop in Los Feliz, and previously ran the original Maru in Valencia for 11 years (it closed in December). 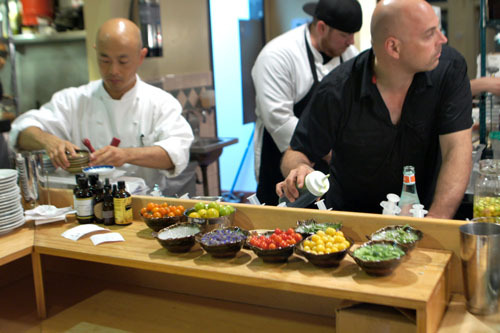 Here, we see Biancaniello and Park at a station set up at the end of the sushi bar. 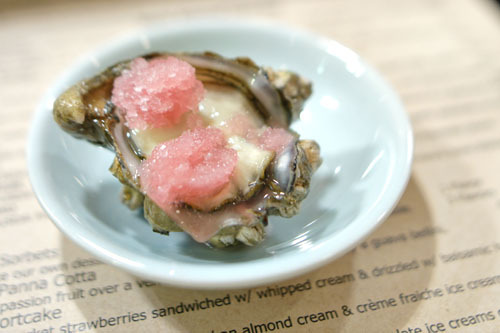 The evening's Boozy Oysters menu featured eight different varieties of the alcoholic bivalves, all priced at $5 each, in addition to an always-tempting uni ice cream. Click for a larger version. 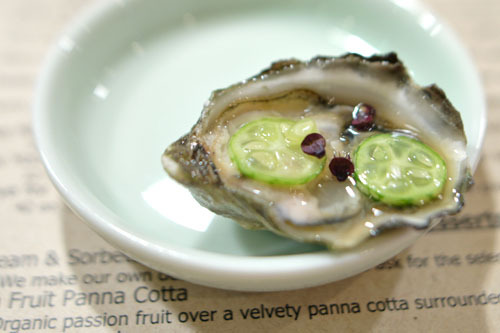 Our barrage of oysters began with Biancaniello's personal favorite. It was one of mine, too, with the boozy heft of the raicilla tempered by the sweet, tart blueberry, all while the combination of Bolivian coriander and borage added a cucumber-y, herb-y brightness to things. 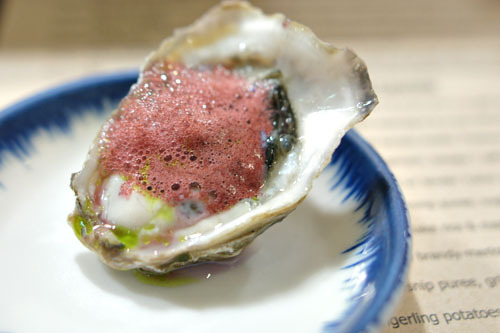 The sole shooter of the bunch, this one brought together a Kumamoto with contrasting notes of tart, cool, and sweet, all of which integrated well with the oyster's inherent brine. Here, wheatgrass imparted a vegetal tanginess to the Kusshi that was moderated in part by the base of vermouth and the sweetness of St-Germain, though overall, this one didn't "click" as well as some of the others. This was another standout for me, with the smoky weight of the scotch melding well with the salinity of the ikura, while the fruit added just enough levity to the Beau Soleil. 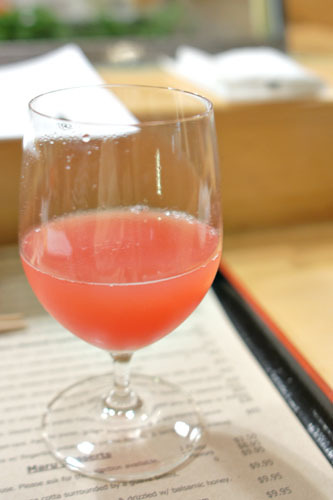 Watermelon juice served as an effective, and delicious palate cleanser in between courses. Yet another favorite of ours featured Kumamoto and hoja santa, the aromatic, spicy nuances of the herb pairing beautifully with the sweet, floral flavors in the course, all leading to a lingering blast of brine on the close. A Beau Soleil with Suze was pretty neat, with the softly bittersweet nature of the apéritif playing well with the salinity of the oyster, all while the habanero made itself known right at the end. Next, a Kumamoto arrived paired alongside the tart, acidic, bright flavors of Toyon berry and mouse melon, with the Thai basil adding an overarching aromatic component to the mix. 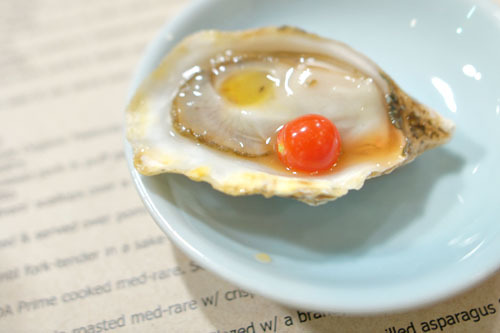 We finished strong with this Campari-infused Kusshi, the bittersweetness of the liqueur and peach pits making perfect sense with the saltiness of the oyster. And we can't forget the passion fruit either, which added a delightful sweetness that really brought everything together. Eight oysters, even boozy ones, hardly make for a complete meal, so we continued on with dinner by ordering off of Maru's regular menu. Click for larger versions. 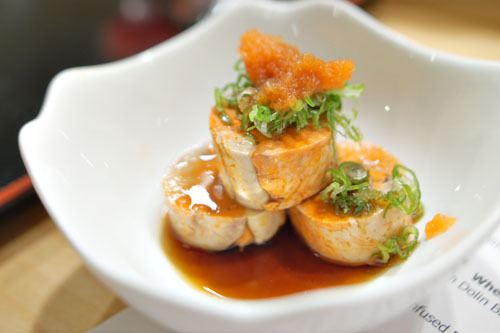 Ankimo Sashimi [$19.00] | Monk fish liver. 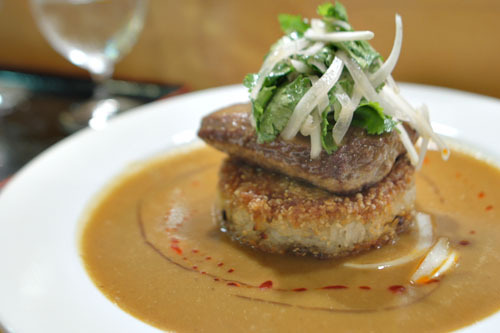 Japanese foie gras. The oft-referenced foie gras of the sea was prototypical for the ingredient--rich, silky, and yes, liver-y, with its heft classically counteracted by the combination of ponzu, negi, and momiji oroshi. Cherry Tomato Salad [$13.00] | Cherry tomatoes w/ our own house made ricotta cheese, shiso pesto, & a sherry vinaigrette. 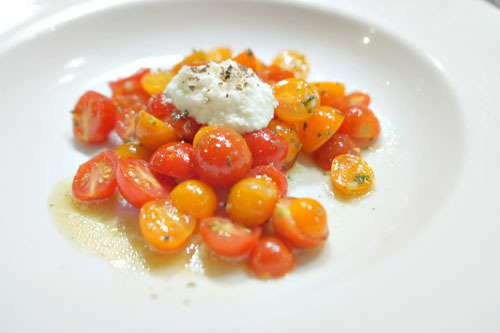 Moving on, the cherry tomato salad was sort of like a reworked Caprese, with the sweet, tart tomatoes balanced by the weight of the ricotta, all while the shiso pesto made for some more interesting flavors. 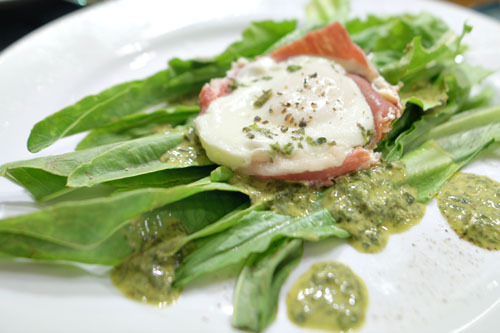 Sword Lettuce Salad [$13.00] | A long & thin lettuce w/ an Asian green goddess dressing & a pan roasted runny egg w/ prosciutto. Here, the richness and salt of the ham-runny egg combo was certainly enjoyable, with its potency balanced by the green goddess and the bitterness of the lettuce. Tomato & Cucumber Salad [$12.00] | Organic Japanese tomatoes & cucumbers w/ avocado tossed in a fire-roasted red bell pepper dressing. 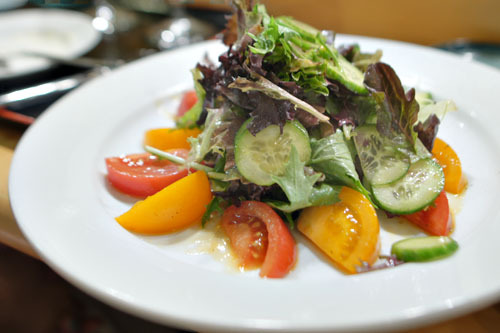 Our final salad was pretty straightforward, the tart, succulent nature of tomatoes pairing well with the light crunch of cucumbers, while the greens added the requisite astringency to the dish. 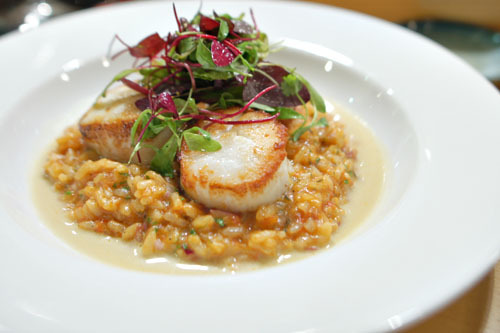 Scallop & Risotto [$22.00] | Seared divers' scallops over a creamy oven roasted tomato risotto. Finished w/ a warm verjus-olive sauce. Scallops came out perfectly cooked: supple, yet satisfying to the bite, with a nice sear and a tasty blend of sweet and saline flavors that made sense against the tartness of the accompanying risotto. I just wish that the rice were a bit firmer. Curry Lamb [$29.00] | Colorado lamb loin roasted med-rare w/ crispy-shiitake rice & marinated onion w/ cilantro & a Japanese curry. Lamb was tasty--not overtly gamy but with a satisfying depth to it, although the meat could've stood to be more tender. The Japanese curry component was quite intriguing here, adding an additional complexity to the dish that worked out surprisingly well. The key, though, was the lightness and acidity imparted by the cilantro-onion combo, while texturally, the nurungji-esque rice cake on the bottom was much appreciated. Time for some beer. 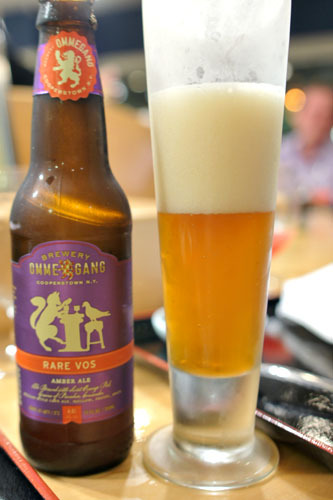 The Ommegang "Rare Vos" Red Ale [$8] was an apt pair to the steak, with a strong malty backbone and a dry, subtly fruity character to it. Ribeye for Two [$65.00] | 42oz. 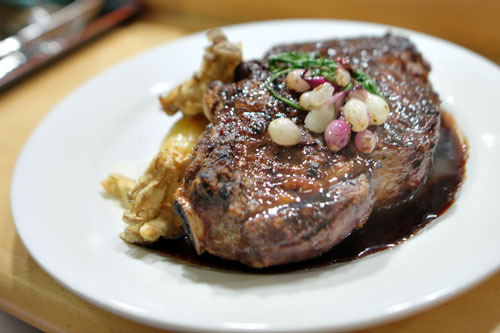 USDA Prime grilled med-rare w/ fingerling potatoes in crème fraiche & tempura buna shiimeji. This impressive looking steak arrived sweet and smoky, with a nice crust to it. Flavors were robust, but I would've liked the meat cooked to a rarer temperature, so that I could've better appreciated its inherent goodness. Potatoes served as a fitting counterpoint to the ribeye, though I found the tempura'd buna shimejis to be even more effective. 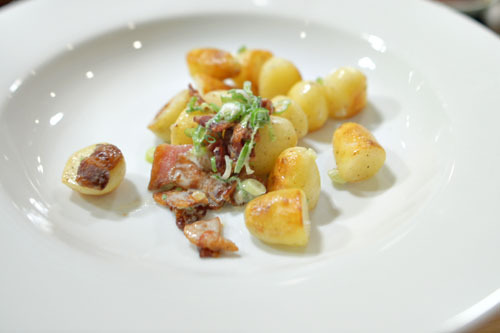 Fingerling Potatoes [$9.00] | Velvety organic potatoes w/ maple smoked bacon tossed w/ crème fraiche. These potatoes, meanwhile, were more interesting, with a great hit of salt from the bacon and a subtle tang courtesy of the crème fraîche. At this point, the kitchen was running out of uni ice cream (unsurprisingly), so we quickly had our fill of the stuff, a collaborative effort between Park and Biancaniello. 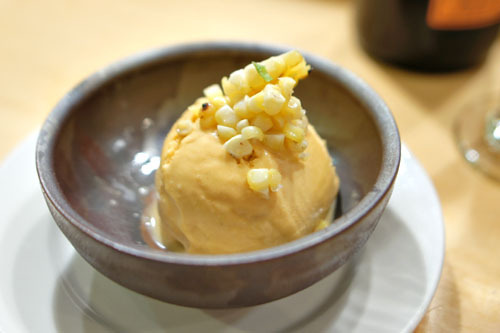 It really was something special though, with the smooth, lush ice cream doing a fantastic job in capturing the sweet, saline essence of sea urchin, all while the corn added an additional, counterbalancing sugary component to the fray. 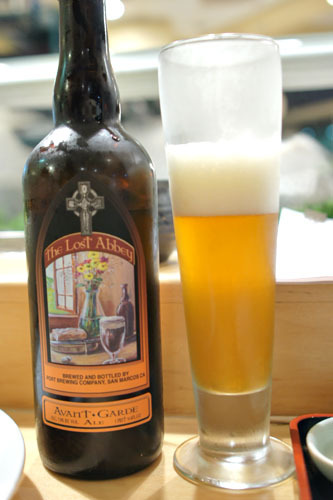 We followed up the Rare Vos with The Lost Abbey "Avant Garde" [$20], done in the Bière de Garde style. This one was very bread-y, with a slight herbaceous tinge to it and some sweet, fruity components as well, overarched by just a trace of bitterness. 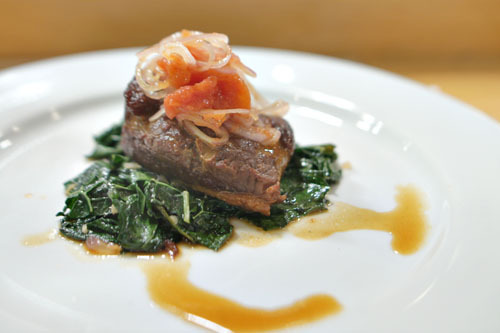 Pork Belly [$16.00] | Braised in sake & soy over garlic black kale w/ marinated shallots & roasted tomatoes. Pork belly was fork-tender, and not overly fatty, with boatloads of deep, dark, sweet flavors. Meanwhile, the astringent shards of kale here served as a fitting temper to the meat, as did the tart, citrusy shallots up top. Pork in Puff Pastry [$21.00] | Tender braised pork in puff pastry. Served w/ grilled asparagus & a soy reduction sauce. 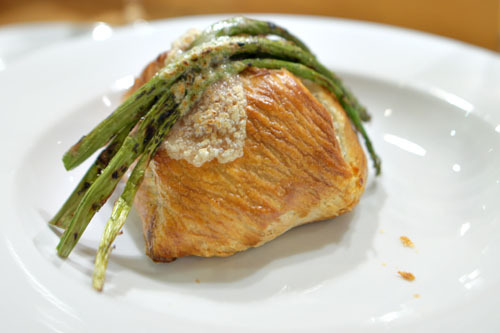 Our last savory course was a riff on the traditional Beef Wellington, and one of the highlights of the meal. Braised pork was almost char siu-ish in nature, showing off a certain sweetness along with plenty of piggy goodness. The flaky, buttery crust was a perfect accompaniment to the meat, and I appreciated the levity and crunch of the asparagus spears here as well. 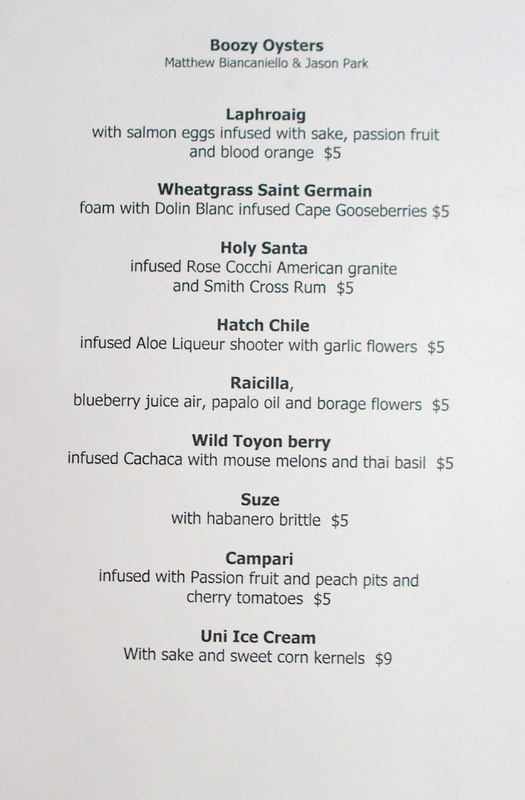 Passion Fruit Panna Cotta [$9.95] | Organic passion fruit over a velvety panna cotta surrounded by a guava bellini. Moving on to desserts now, the panna cotta was one of the better ones I've tried, with the tartness of passion fruit working beautifully over the dish's lush, smooth, creamy base. 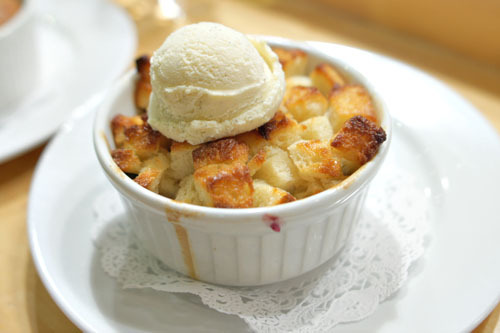 Chocolate Bread Pudding [$8.95] | An adult bread Pudding w/ Valrhona semi-sweet chocolate. Served w/ vanilla ice-cream. Baked to order. The bread pudding made sense with its interplay of chocolate and vanilla ice cream flavors, but what made it unique was its texture, with all the crispy bits thrown in. Melon Soup [$8.95] | Frozen ambrosia melon juice w/ a watermelon soup, strawberries, grapes, & blueberries. The melon soup, meanwhile, was utterly refreshing and light, with the central mass of sugary melon juice melding well with the lighter, more subtle nuances at play. 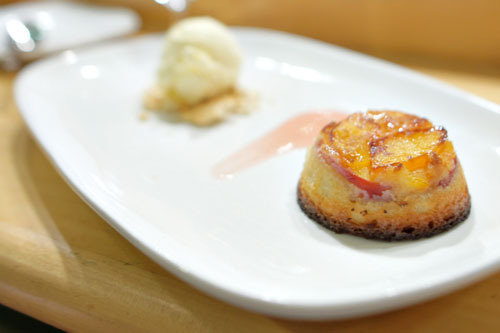 Peach Tart [$9.95] | Reiger Farms Elegant Ladies baked w/ an almond cream & crème fraiche ice cream. A peach tart lived up to expectations, its fruity, sugary heft working alongside the deceptively light crème fraîche commendably. 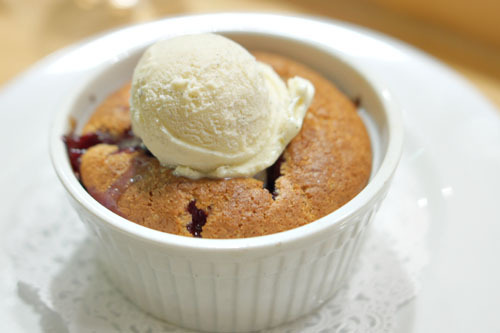 Peach / Berry Cobbler [$8.95] | Organically grown fruit baked to perfection & topped w/ our Tahitian Vanilla ice-cream. Baked to order. Finally, a cobbler arrived hot (very hot, actually) and hearty, a mélange of batter and fruit interjected by the cool, silky smoothness of that ice cream. Biancaniello's latest foray into non-cocktailian realms was largely a success. 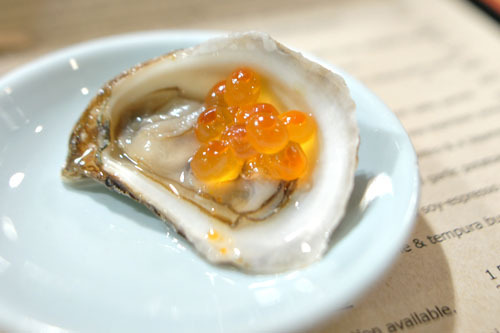 There were some inventive, well-thought-out flavor combinations going on with the oysters, and I liked how he was able to present boozy, creative interpretations of the bivalves without masking their inherent goodness and character. 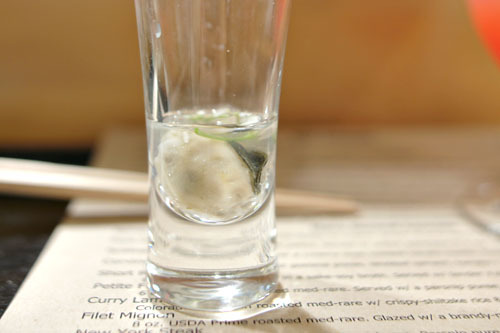 Biancaniello often refers to himself as a sort of "cocktail chef," and clearly this experiment was another step in that direction. In addition, I was glad that I got to sample some of Maru's regular menu items as well. There's a sort of classic Franco-Japanese fusion thing going on here, and the results were generally effective. 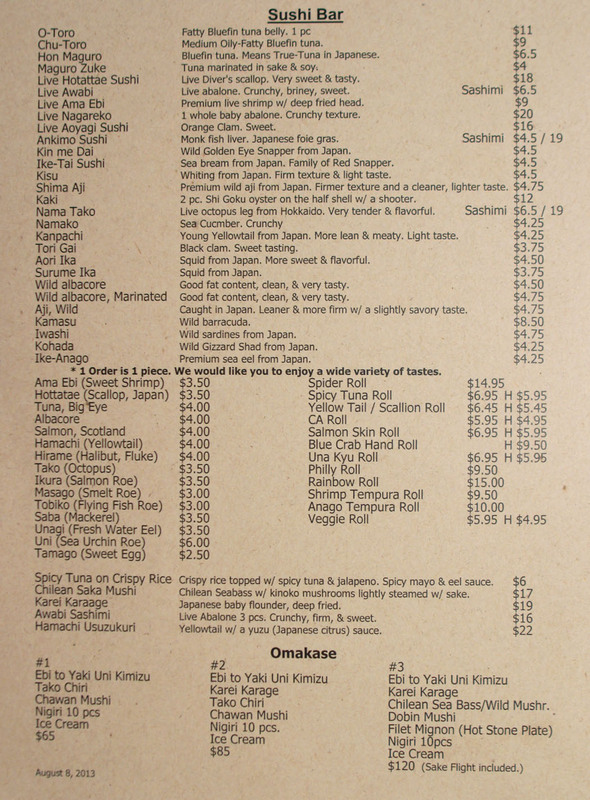 I think it's a fitting replacement for the old Sasabune, offering up sushi in addition to more "Western" fare. And speaking of that sushi, I'm a bit curious about it as well, because from what I saw, the nigiri here looked pretty legit, too. 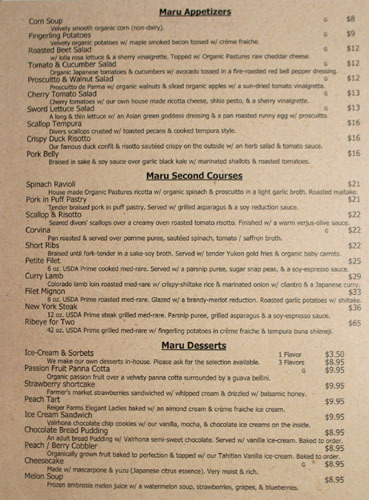 The food looks delicious but the pricing seems excessive, particularly with respect to the oysters, the salads, and the fingerling potatoes. 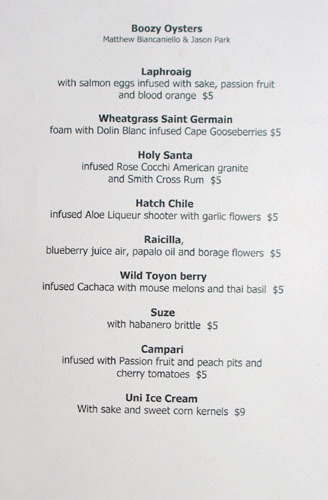 I rarely dine in Santa Monica, though, so maybe those prices are competitive. Al - you should really try Maru. i've heard similar comments but living on the westside and near beverly hills the past 17 years, the prices are very reasonable. for example, Maru serves my favorite ribeye but the size of the protein is a lot bigger than other restaurants in the same price range. 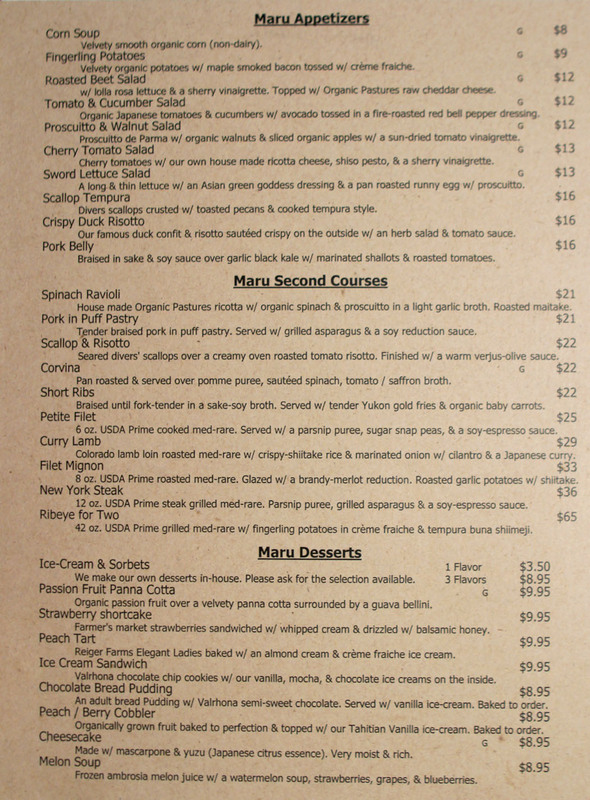 if you go to some other restaurants with similar quality food, their small plates and appetizers range from $9 to $25. 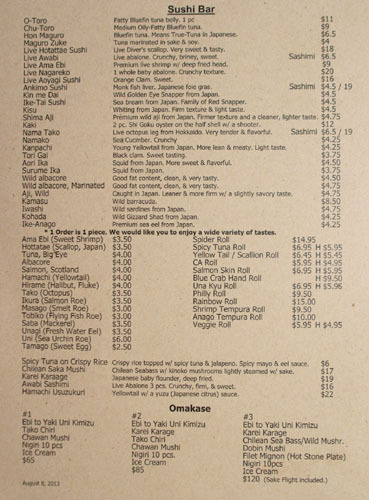 Anyways, hope you try Maru, it is one of my favorite restaurants. the chef at Maru uses really fresh ingredients. if you go, ask how/where they get their fish. it's pretty cool. Anon: Yeah, when I talked to Jason, he seemed to indicate that the omakase in front of Take-san was the way to go as well.